Ryoan-ji, originally an aristocrat's country villa, was convarted into a Zen temple in 1450. In 1488, the Hojo was restored, and repairs were made to the other temple buildings. When these were destroyed by fire in 1797, the Hojo of the Seigen-in, built in 1606, was relocated to Ryoan-ji; this structure is the present Hojo, which serves as the main hall of the temple. 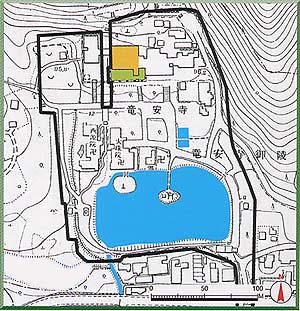 The temple garden, which lies on the Hojo's south side, is thougt to date from the mid-15th century. 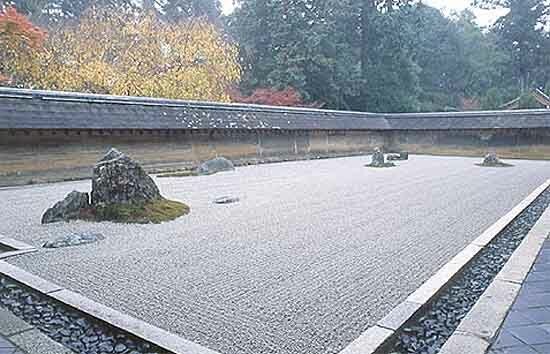 A rock-and-gravel garden comprising 15 rocks in five groupings, arranged on a bed of white gravels, it is renowned throughout the world as an ultimate example of the karesansui (dry landscape) style rock garden, in which nature is compressed and given abstract expression within the confines of a very narrow space.